Work has completed on path restoration on one of Scotland�s most popular Munros. The footpath heading through about a mile of Forestry Commission Scotland land from Rowardennan up Ben Lomond has been upgraded as part of The Mountains & The People project, a five-year project led by the Outdoor Access Trust for Scotland (OATS). This matches up with paths on the National Trust for Scotland-owned upper slopes of Ben Lomond, which are repaired and maintained by the NTS� in-house path team, ranger service, and volunteers. For several weeks the NTS also hosted some OATS trainees on a section of the upper hill path as part of their apprenticeship. With over 30,000 visitors per year, Ben Lomond is one of the most popular Munros in Scotland, offering fantastic views of Loch Lomond and beyond. With such large numbers of people, the trail had suffered over the years, but is now described as a �well defined path�, starting from the Rowardennan car park half way up the eastern shore of Loch Lomond. The Mountains and The People project is devised to preserve, improve and restore access to the unique upland habitats in our National Parks. Led by the Outdoor Access Trust for Scotland and supported by both of Scotland�s National Park Authorities, Scottish Natural Heritage, Forestry Commission Scotland and Heritage Lottery Fund, the project is well on the way to making a huge difference. 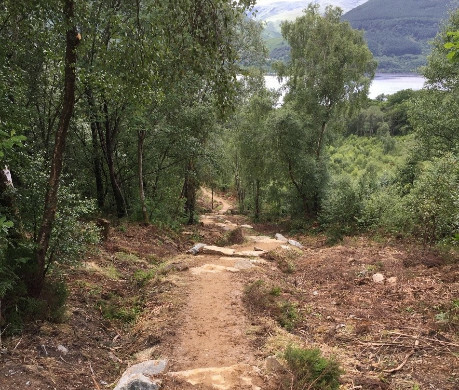 Over the past two years, work has been carried out on nearly 21.5 km of paths, upgrading the trails on some of the best loved mountains in Loch Lomond & The Trossachs, including Ben Ledi, Ben A�an, Ben Venue and Scotland�s most southerly Munro, Ben Lomond. Simon Jones, Director of Conservation and Visitor Operations at Loch Lomond & The Trossachs National Park, said: �The iconic mountains of the National Park attract people from all over the world as well as many walkers from closer to home. With their stunning views and opportunity to get out and enjoy nature, it�s easy to see why. But the volume of people walking these paths does have an impact on their condition. A section of the upgraded path on Ben Lomond.